The Queen has paid tribute to her aunt Princess Alice, the Duchess of Gloucester, who has died aged 102. Lady Alice Christabel Montagu Douglas Scott died peacefully in her sleep late on Friday night with her close family at her side, Kensington Palace said. Buckingham Palace said in a statement that the Queen had been "greatly saddened" by the death of her aunt. The Queen remembers with gratitude Princess Alice's service to the monarchy and to the country," it added. A spokesman said: "After the Princess's marriage to Henry, Duke of Gloucester, in 1935, Princess Alice supported the work of King George VI and then the Queen over many years through war and peace and despite the tragedy of the early death of her eldest son." Princess Alice, third daughter of the Duke of Buccleuch, married Prince Henry, the third son of King George V, in 1935. The BBC's royal correspondent Nick Witchell says she saw the abdication crisis at first hand and was fully involved in the Royal Family's efforts to maintain the nation's morale during the Second World War. She had lived at Kensington Palace since 1995, when she left her home at Barnwell Manor in Northamptonshire. She was rarely seen in public after that move. 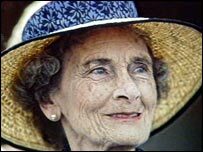 Princess Alice was born on Christmas Day in 1901 and became the oldest ever member of the Royal Family when she reached the age of 101 years and 238 days in 2003. Her eldest son, Prince William, a pilot, died in a crash at an air show in 1972. Two years later her husband died after suffering a series of strokes. The pair had been involved in a car crash in 1965 after attending the funeral of Sir Winston Churchill. Princess Alice held a passion for travel and spent time in Kenya, India, Afghanistan and Australia. Her body is to remain in a private chapel at Kensington Palace while funeral arrangements are being made.